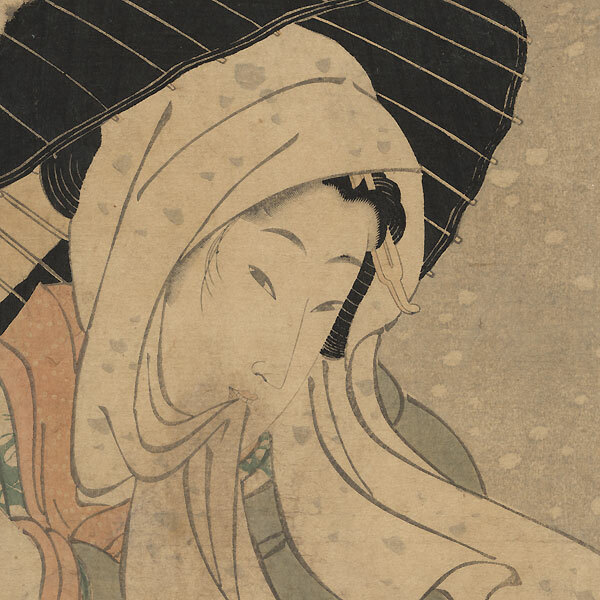 Comments - Lovely kakemono or vertical diptych of a beauty walking through the snow, holding a partially closed umbrella over her head as she faces into the wind. 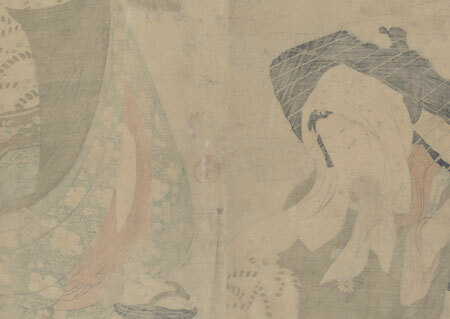 She wears a gray kimono bordered with a yellow-green cherry blossom print over a red under robe, tied with a light green and gray print obi with a stylized dragon border. The end of her scarf is caught between her teeth to keep it from blowing away in the breeze. The first time we've offered this attractive Edo era beauty design. Condition - This print with excellent detail as shown. Two separate panels. A few thinning spots, repaired. Light toning, slight soiling and creasing, rubbing at edges, a few stains. Please see photos for details.